I admit it, I am a total Facebook addict. I’ve played my fair share of the Facebook games over the years! My daughter plays games as well, and I prefer that if she is going to play something, she play something that is appropriate for her age. I want to share with you the new Facebook game, A Better World, that rewards its players for in-game activities AND for real world acts of kindness and expressions of gratitude. With such a positive message, it’s no wonder that A Better World already has over 120,000 players! There are a ton of games out there on Facebook, but this is the only one I have seen that actually has a positive message! A Better World is most popular with women, perhaps because it adds a layer of social activity to casual gaming. The activities are designed to help people feel better about themselves, be supportive of others and to make positive choices in their lives. 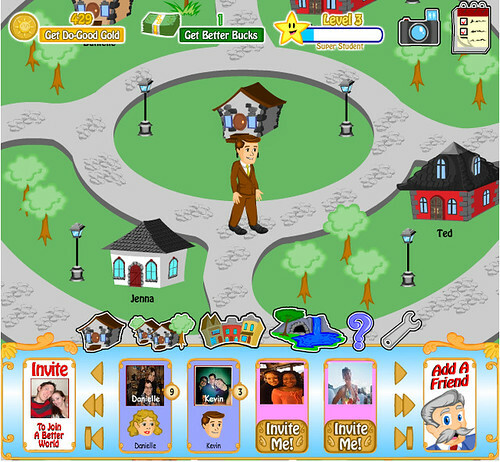 Players are able to personalize their characters and spaces in the game, and play with and care for virtual pets. How cute is that? You can also play mini games within the game with inspirational themes, which is a really cool feature! This is a game that I feel comfortable with my daughter playing, as well as my younger niece who likes to use the computer when she comes over to our house. When she wants to play A Better World, I have absolutely no worries! A Better World was created by ToonUps, a digital entertainment company that has focused on developing digital content that encourages a positive outlook and altruistic behavior. ToonUps has been creating these wonderful games for over a decade! ToonUps created A Better World with the hopes that it will usher in a genre of “do good gaming.” Research shows that being encouraged to think about things they are thankful for and doing activities that provide encouragement to others improves their mental, emotional and spiritual well being.